Aerosol radiative properties are investigated in southeastern Spain during a dust event on June 16-17, 2013 in the framework of the ChArMEx/ADRIMED (Chemistry-Aerosol Mediterranean Experiment /Aerosol Direct Radiative Impact on the regional climate in the MEDiterranean region) campaign. Particle optical and microphysical properties from ground-based sun/sky photometer and lidar measurements, as well as in situ measurements onboard the SAFIRE ATR 42 French research aircraft are used to create a set of different levels of input parameterizations, which feed the 1-D radiative transfer model (RTM) GAME (Global Atmospheric ModEl). We consider three datasets: 1) a first parameterization based on the retrievals by an advanced aerosol inversion code (GRASP; Generalized Retrieval of Aerosol and Surface Properties) applied to combined photometer and lidar data; 2) a parameterization based on the photometer columnar optical properties and vertically-resolved lidar retrievals with the two-component Klett-Fernald algorithm; and 3) a parameterization based on vertically-resolved optical and microphysical aerosol properties measured in situ by the aircraft instrumentation. Once retrieved, the outputs of the RTM in terms of both shortwave and longwave radiative fluxes are compared against ground and in situ airborne measurements. In addition, the outputs of the model in terms of the aerosol direct radiative effect are discussed with respect to the different input parameterizations. Results show that calculated atmospheric radiative fluxes differ no more than 7 % to the measured ones. The three parameterization datasets produce a cooling effect due to mineral dust both at the surface and the top of the atmosphere. Aerosol radiative effects with differences up to 10 W·m-2 in the shortwave spectral range (mostly due to differences in the aerosol optical depth), and 2 W·m-2 for the longwave (mainly due to differences in the aerosol optical depth but also to the coarse mode radius used to calculate the radiative properties) are obtained when comparing the three parameterizations. The study reveals the complexity of parametrizing 1-D RTMs as sizing and characterising the optical properties of mineral dust is challenging. The use of advanced remote sensing data and processing, in combination with closure studies on the optical/microphysical properties from in situ aircraft measurements when available, is recommended. 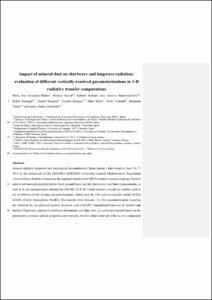 Granados, M., Sicard, M., Román, R., Benavent, P., Barragan, R., Brogniez, G., Denjean, C., Mallet, M., Formenti, P., Torres, B., Alados, L. Impact of mineral dust on shortwave and longwave radiation: evaluation of different vertically resolved parameterizations in 1-D radiative transfer computations. "Atmospheric chemistry and physics", 14 Gener 2019, vol. 19, p. 523-542.